Mr. and Mrs. Claus greet parade goers during the 26th annual Welcome Santa Christmas Parade Sunday in Ottawa. Members of Breakthrough Harvest Community Church won first place for their float in Sunday’s Santa parade in Ottawa. 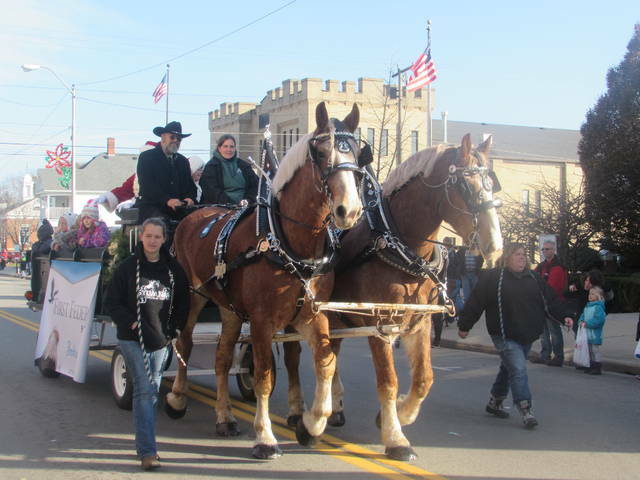 Sandridge Farm, Liberty Center, had their Belgium horses in Sunday’s parade. Center Stage Dance Academy members ride in their float they decorated. OTTAWA — Marching bands, floats, dance groups and scouting troops filled the streets of Ottawa Sunday to usher in the Christmas season. 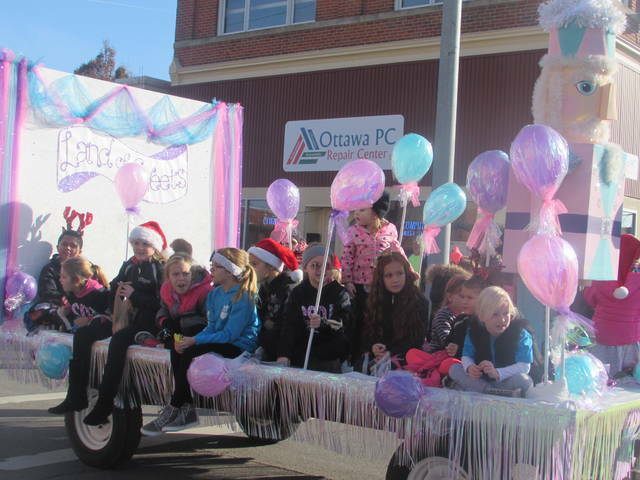 The Village of Ottawa held its 26th annual Welcome Santa Christmas parade, sponsored by the Ottawa Area Chamber of Commerce. There were over 50 floats in this year’s parade, according to Cathy Burgei, chamber executive director, who helped organize the parade with the help of her assistant Kelly Theisen. “This parade kicks off the season and brings people together and encourages them to come out,” Burgei said. Greg and Tricia Brinkman of Glandorf, and their three sons, Lochlan, 8, Taten, 5, and Parxton, 2, wore Santa hats and reindeer bell necklaces as they watched the parade. “It’s a family tradition to come out to the parade. They love to see Santa Claus,” Tricia said. They have attended the parade for the past four years. Recker-Trame VFW Post 9142, Kerner-Slusser American Legion Post 63, Disabled American Vets Chapter 77 and AMVETS carried flags during the parade behind Putnam County Sheriff and Ottawa Police Department vehicles. Ottawa-Glandorf and Miller City High School marching bands entertained parade goers with Christmas music. The parade emcee was Big Kahuna from 106.3 The Fox, announcing the groups in the parade as they went by. The top three winners for floats were Breakthrough Community Harvest Church, Girl Scout Troop 20024 and Croy’s Mowing Ltd.
First Federal Bank sponsored Santa’s drawn wagon from Sandridge Farm with Santa and Mrs. Claus. Robert Morrison, of Sandridge Farm, had two Belgian horses that guided the sleigh. The horses wore a black and silver parade harness. “The horses have been in the parade for six years. 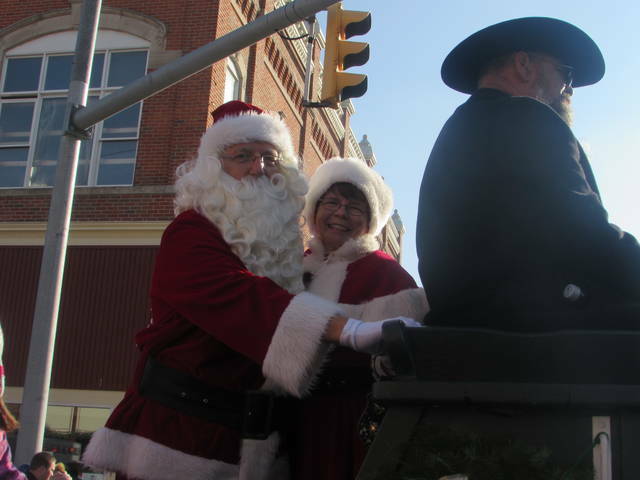 The kids love it when they see Santa and point him out and wave,” Morrison said. The grand marshals for the parade were small business of the year, Beckman Jewelers and large business of the year, Henry’s Restaurant. The parade lineup was organized by Jim Heringhaus, Joe Laudick, Brice Musser, Shlomo Haviv, Kevin Bellman and Dan Irwin. Family activities following the parade included photos with Santa, horse-drawn wagon rides, miniature train rides, live music and refreshments. Center Stage Dance Academy performed dance routines on the center stage, and there was a performance by the Ottawa-Glandorf High School Show Choir. https://www.limaohio.com/wp-content/uploads/sites/54/2018/11/web1_IMG_1720-2.jpgMr. and Mrs. Claus greet parade goers during the 26th annual Welcome Santa Christmas Parade Sunday in Ottawa. 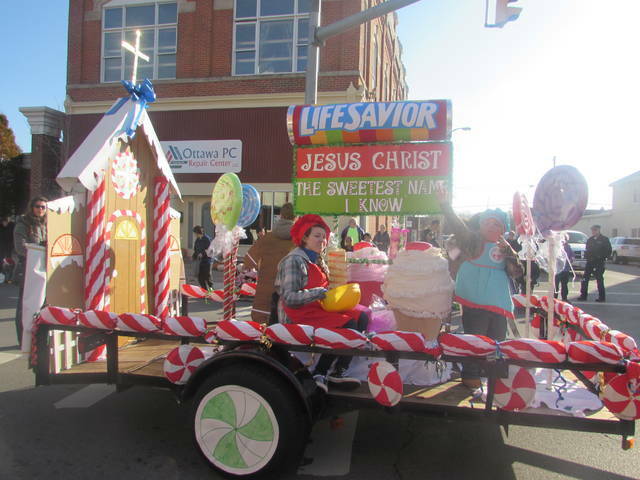 https://www.limaohio.com/wp-content/uploads/sites/54/2018/11/web1_IMG_1703-2.jpgMembers of Breakthrough Harvest Community Church won first place for their float in Sunday’s Santa parade in Ottawa. https://www.limaohio.com/wp-content/uploads/sites/54/2018/11/web1_IMG_1717-2.jpgSandridge Farm, Liberty Center, had their Belgium horses in Sunday’s parade. https://www.limaohio.com/wp-content/uploads/sites/54/2018/11/web1_IMG_1682-2.jpgCenter Stage Dance Academy members ride in their float they decorated.